Impressive, imposing, intimidating, incredible are the words that swirled through my mind as I drove along the Scenic Highway through Zion National Park. The winding, narrow road weaves its way past checkered mesas, rocky gorges, and jagged mountaintops. The bright orange rock formations look as if they’re made from flowing lava that suddenly stopped running and solidified instantly capturing a moment in time rather than showing millions of years of slow geologic activity. 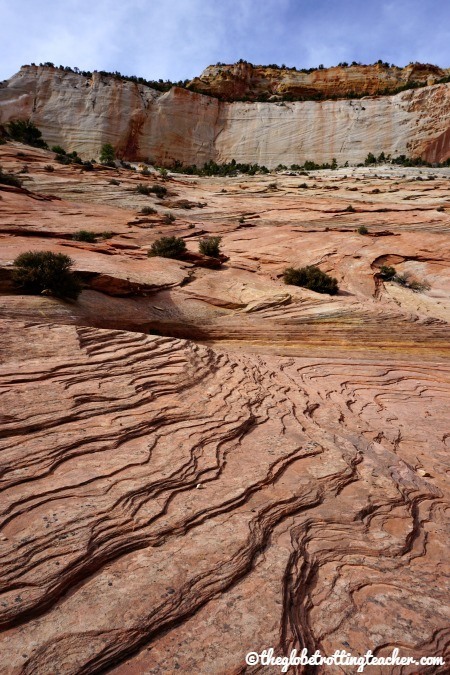 Layers of sandstone…Looks like hardened lava to me! Evergreen trees and shrubbery dot the rocky landscape. Deer and mountain goats spring across the road with the same spontaneity that I’m even driving this road after putting together this last minute road trip en route from the car. I haven’t planned for Zion’s majesty. Even after just visiting Arches, Canyonlands, and Bryce National Parks, I was unprepared for how Zion’s grand introduction would at once sweep me off my feet and show me what it means to have reverence for nature. Continuing on (mouth agape), I plunged into deep darkness as the road snaked through the 1.1-mile Zion-Mt. Carmel tunnel carved through a seemingly impassable block of rock in what has to be a truly notable engineering feat. Not realizing how long the tunnel was at first, I was sure we’d been swallowed by the towers of rock and were destined to meld with the layers of rock surrounding us. 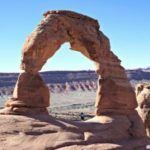 It’s with good reason Lonely Planet, Fodor’s, and Frommer’s all list the U.S. National Parks, in particular, Zion and the Utah National Parks as top travel picks for 2016! Experiencing Zion National Park ranks high on many a bucket list. 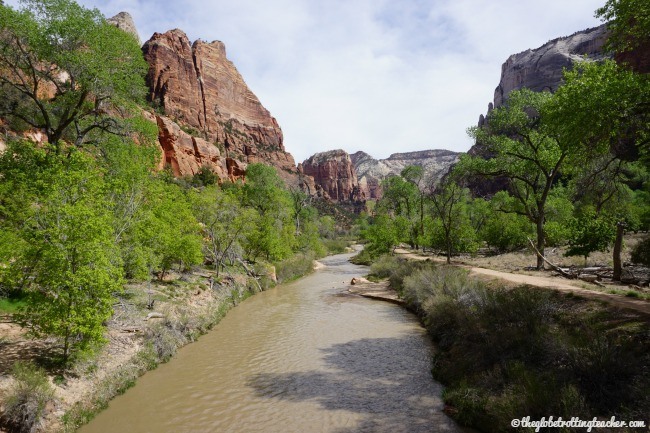 Here’s what you need to know for a successful Zion National Park Visit! How do I get to Zion National Park? The closest major airport is McCarran International Airport in Las Vegas, Nevada. Las Vegas to Zion National Park is a 2 1/2-3 hour drive. 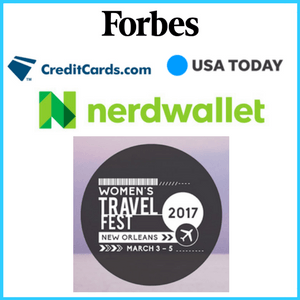 You can rent a car from all the major companies at the airport, just be sure you know my money-saving secret weapon for car rentals! 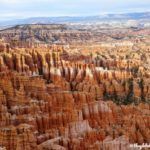 If you’re already in the area visiting other Utah National Parks, Bryce National Park is about a 1 1/2 drive. Capitol Reef National Park is just under 4 hours by car. 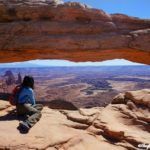 Driving from Arches or Canyonlands National Parks would take about 5 hours. If you’re coming from Monument Valley or the Grand Canyon, plan on 4 hours of road time before arriving at Zion National Park. 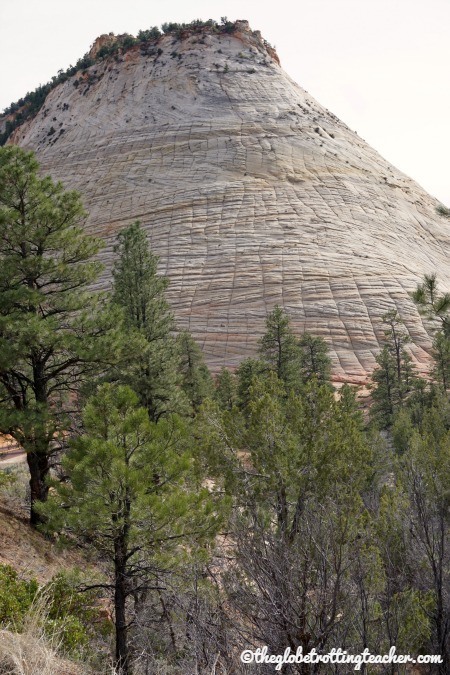 Are there hotels near Zion National Park? 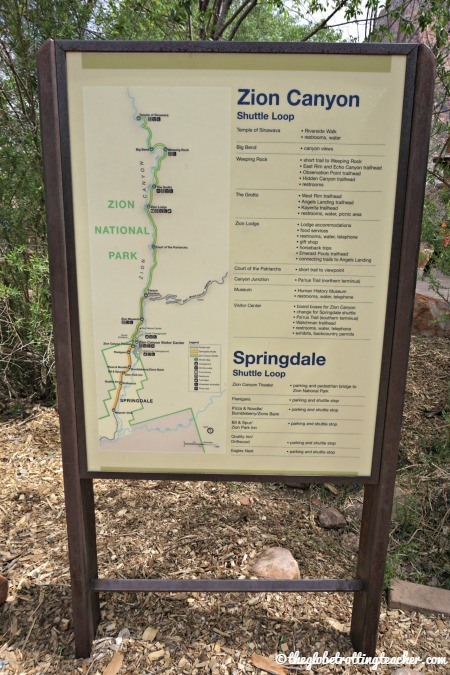 The gateway town of Springdale is just outside Zion’s entrance and Visitor Center. The town has several hotels, B&Bs, and inns just minutes from the National Park entrance. I had an excellent stay at the Holiday Inn Express in Springdale. The free Zion Shuttle stopped right out front! 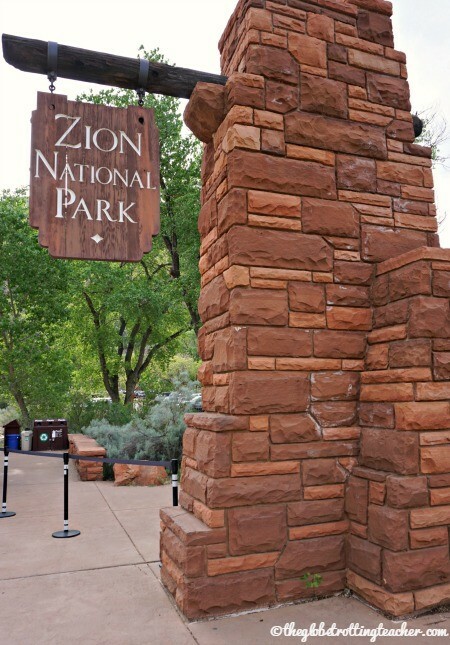 You can also search and book Zion National Park hotels at the best rate using the search box below. The Zion National Park Lodge is the only lodging available within the park. Several hiking trails begin at the Lodge. The horse corral across the road offers horseback riding excursions. The Zion Shuttle stops at the Lodge to transport guests throughout the park. As one of my readers pointed out, staying at the Zion Lodge allows you to experience the tranquility of the park in the morning and evenings before and after all the day visitors have come and gone. Stroll along the Virgin River. Reservations for the Lodge can be made up to 13 months in advance. Starting with the 1st of each month, the calendar opens for that whole month in the following year. The Lodge books quickly. If this is where you’d most like to stay, make reservations as soon as you know your plans. Bookings can be canceled for free or modified (depending on availability) up to 2 days prior to your arrival. Zion National Park also has 3 campgrounds. From spring to fall, the campgrounds are extremely busy. If possible, make reservations ahead of time or arrive in the morning to (hopefully) snag a spot! 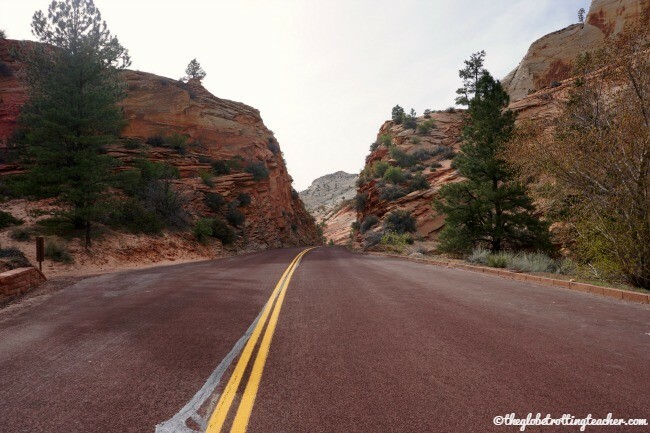 Can I drive into Zion National Park? The driving and parking situation in and around Zion National Park is extremely busy. You want to have a plan and get it right in order to make the most of your time. The Zion National Park-Mount Carmel Scenic Highway cuts through the mountains along Route 9 between the towns of Mount Carmel and Springdale. This road is open for park visitors, as well as drivers passing through. There are park entrance booths at either end of the highway requiring all drivers to pay the entrance fee or show a park pass. If you’re visiting multiple National Parks, consider getting the America the Beautiful Pass to save money on park entrance fees. 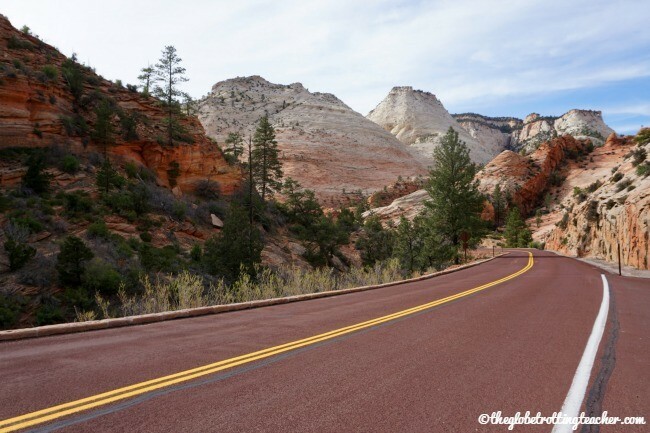 The Zion-Mount Carmel Highway is a must-drive! This is the only road visitors are allowed to drive on between March and the end of October. 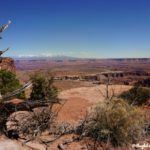 While there are some small pull-offs and a few parking spaces along the Scenic Highway for photos and the few trailheads that start here, you should plan on NOT driving into the park for the day. Instead, park along the main road in Springdale and use the free town shuttle to the Zion Visitor Center. The earlier you arrive the better success you’ll have at finding parking in Springdale. If you’re staying at a hotel in Springdale, do not move your car. Simply walk to the nearest shuttle stop along the main road and take it to the last stop, the park entrance and visitor center. The shuttles are easy, no-stress ways to get around Springdale and the park. After entering the park, board another shuttle and head into the main area of the park where private vehicles are restricted. The park shuttle makes 9 stops for popular park destinations like Angel’s Landing or the Narrows. The shuttles were efficient, easy to use and ran every few minutes. 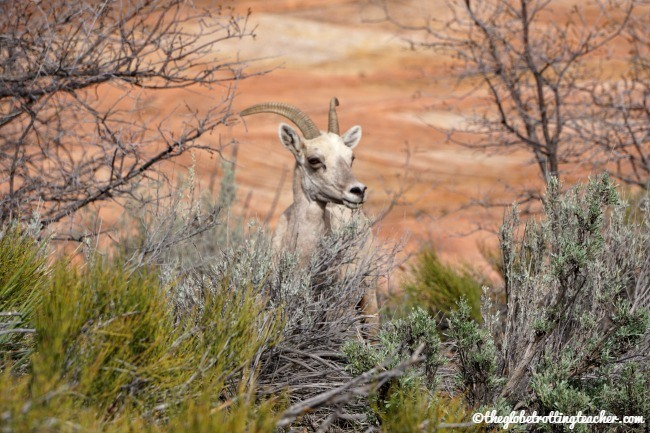 What do I need for a day in Zion National Park? You should prepare for as long as you plan to be out in the park. This means bringing enough food, water, sunscreen, insect repellent, and any supplies needed for the day’s activities. Refill your water supply at the Visitor Centers, the Zion Lodge, and campgrounds within the park. Zion Lodge also has a cafe serving basic breakfast and lunch options. Springdale has a supermarket, convenience stores, and cafes providing takeaway snacks and sandwiches. How much does it cost to get into Zion National Park? The pass for a private vehicle and its passengers costs $30 and is valid for 7 consecutive days. 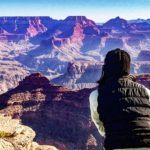 If you plan to visit more than 1 National Park, the America the Beautiful Pass is the best way to save money for most visitors. You can also find out how to save money on park fees if you’re a senior, active military or have a 4th grader. 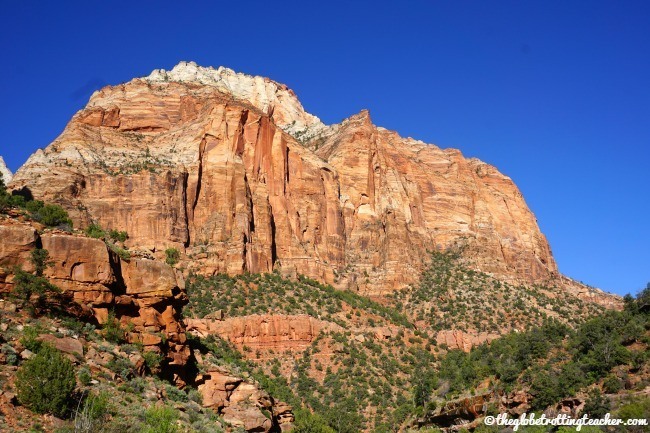 What are the best things to do in Zion National Park? There’s no shortage of activities for all interests and age groups in the park. 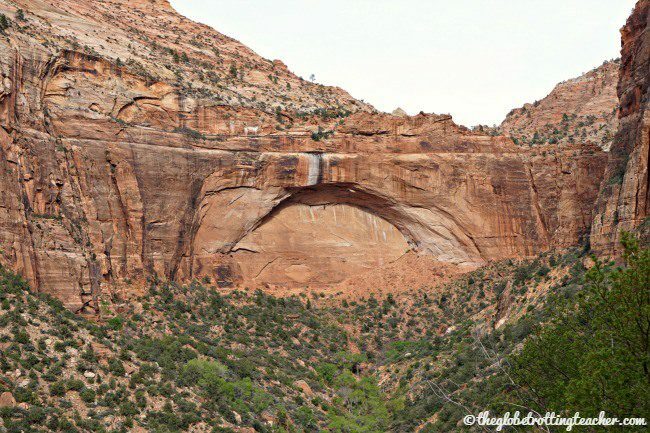 Some of the Zion National Park hikes are even world famous! 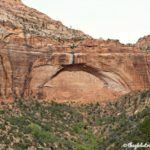 The 2nd post in my Zion National Park Series highlights 8 Spectacular Things to Do at Zion National Park! 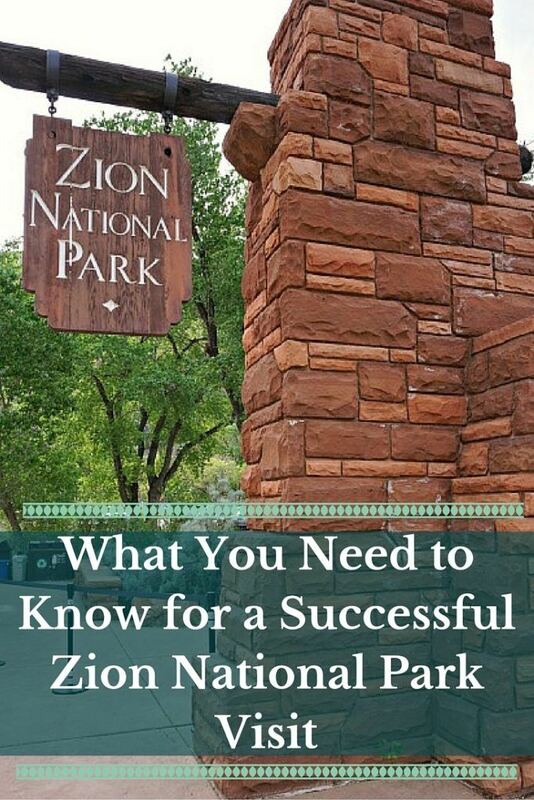 Here’s a sneak preview to get the ideas flowing for how to best spend your time in Zion. Have you been to Zion National Park? What are your top tips? What have I missed? 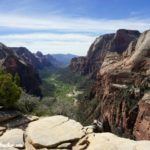 “I was unprepared for how Zion’s grand introduction would at once sweep me off my feet and show me what it means to have reverence for nature.” – Utah did this to me over and over again when we visited, and we haven’t even been to Zion (yet). I’m so happy to know that we have lots more exploring to do in this beautiful state. I’m biased for sure, but Tara, you’ve saved the best for last! Zion is truly magnificent! Hope you can visit soon. I’ve never been to Zion national park, but it’s definitely a place that is on my bucket list. Hopefully I can make it out there one day and do some of the hikes or even a bit of horseback riding. It sounds like you had a nice time! Though its been a few years since I’ve been Zion is one of my favorite National Parks. I even liked it more than Zion! That should be I liked it more than the Grand Canyon. That’s what I get for commenting late at night lol. That is such a beautiful part of the states. I have never traveled to Utah and my husband and I are hoping to do a road trip similar to this next year. Definitely the Arches is my #1 spot to see but they are all so unique and gorgeous! I hope your road trip happens, Melody! Utah is such a gorgeous state! If you make it to Arches, Canyonlands NP is just 20 minutes away and Zion and Bryce are just 4-5 hours in the car. They’re all so worth it if you have the time! I loved our time at Zion National Park – it was the first US NP I visited and has a special place in my heart. I loved the Riverwalk and got almost to the top of Angels Landing – but missed out on the very top section because it was too windy! Thanks for sharing these tips to help others on their visit! What a grand introduction you had to the US NPs, Vicki! Zion is a true gem in the NP Service. Too bad about the wind, but better to be safe than sorry at Angel’s Landing! I have visited Zion National Park a few times. But every time I go, there is always some new place I hadn’t visited previously or a hike I haven’t done before. It really is one of the best of the US NPs. You said it, Christina. Zion NP is truly one of the best NPs in the US. I can’t wait to return and, like you, find more to explore! Great tips. I spent 7 days there with my daughter over spring break. Zion became my favorite national park for sure. 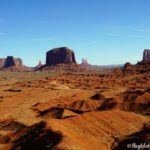 I haven’t explored much in this part of the country, although I did spend some time in Arches. Your guide is very helpful, and your enthusiasm is contagious so I can’t wait to go and explore Zion next. I cannot wait to make a trip out west to visit all of the national parks – Zion being near the top of my list. I’m not sure how much I’d love driving through a tunnel but the scenic drive looks amazing. Perfect, Trisha! I’m sure you will love it and glad the tips will be useful! Is September too late to visit and hike Zion? Thinking about going at the end of July but the weather during the day seems like it might be too hot. Do you know if it is cooler within the park than weather forecasts? Wondering if we should just wait to go another time of the year. Hey there! 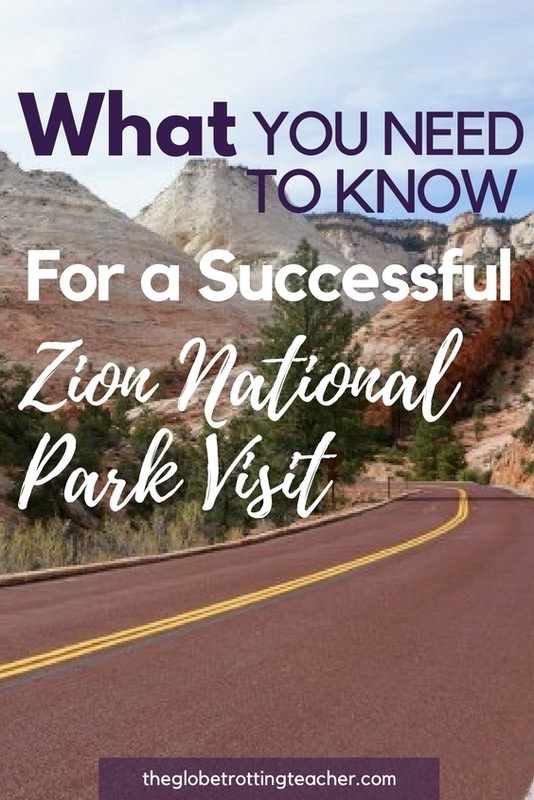 I have a few more tips to add to your great list if you’re interested 🙂 I live 30 min from Zion’s and spend at least one day there a week…. We hit the mighty 5 plus, Hoover dam, Grand Canyon and Goblin Valley state park this past Summer on my daughters 5th grade national park pass. In my opinion Zion was either the best or tied with arches, and goblin for the best overall stops. My top tip for people flying into Vegas and staying in Springdale is to stop at the Hurricane UT Walmart and stock up. While we loved our accommodations at the mom and pop Zion Park Motel, Springdale is a tourist trap where everything costs more than your used to. When/if we go back in a few years when my son is in 5th grade we will be much better prepared.